For the second year, Dogs of MSP is partnering with KME Photography to offer Mother's Day Mini Sessions! We understand the special bond between furry family members, and what better way to commemorate the holiday than with a photo session with your pup. If you know a deserving dog mom, this is also a unique gift idea! We will be a vendor at the Animal Humane Society's Walk for Animals, so stop by and visit us! This event brings together more than 9,000 people and 3,000 animals to wag, walk, and raise funds for homeless animals across Minnesota. With your support, thousands of animals will get the care they need to find new homes and loving beginnings! This year's Walk will be hosted on Saturday, May 4, at our Golden Valley location. Calling all MVPs (Most Valuable Puppers)! Take your dog to the ballgame at the fourth annual Dog Day presented by Chuck & Don's at CHS Field Saturday, May 25 at 7:05pm. Enjoy free giveaways, product samples, special activities and lots of furry friends. Get there early, the first 1,000 dogs through the gate get a limited-edition bandana. Special tickets (including a Saints hat and a $5 coupon) are available at saintsgroups.com (password: dogday2019). Everybody wins with this ticket package because a portion of the proceeds go to Northern Lights Greyhound Adoption, a nonprofit dedicated to finding responsible homes for retired racing greyhounds and educating the public about greyhounds as pets. Any tickets purchased for May 25 include admission for your dog to the game. We are heading to Flat Earth Brewing Company for our April Meet Up, and we hope you'll join us! This event is FREE, and it's a great time to grab a beer with friends (non-alcoholic options available too), connect with members of your community, and meet local insta-famous pups like ShermantheTank. Who knows, you and your dog may just meet your new best friends. Even if you don't have a dog, we encourage you to come hang out with good people who love dogs! We will have our pup-ular merchandise for sale, including dog and and human apparel, and Finley’s dog treats. Dogs are are welcome inside the taproom as long as they are leashed and well-behaved (please do not bring reactive or aggressive dogs). If it's nice enough to be outside, Flat Earth also has a spacious outdoor area. Food truck will be D&D Goodies. Free parking lot connected to taproom. We hope you'll join us for our March Meet Up at Lakes & Legends Brewing on 3/3 from 1-4pm! Our events are a fun opportunity to connect with members of your community and bond over your love of dogs. Meet pups you recognize from Instagram, and who knows, your dog may just meet their new best friend. Bark your calendars! We are headed back to Lakes & Legends Brewing Company for our February Meet Up! This will be a Sunday Funday to remember. Since it's Super Bowl Sunday, we will be showing Animal Planet's Puppy Bowl on the big screen at 2 pm. Come watch the game with us! We also will have an Instagrammable set up for Valentine's Day photos. We've restocked our new Woofda hoodies and we'll be releasing adorable new knit winter hats for humans! SAVE THE DATE! We're bringing back our popular Brews Cruise event where we take a dog-friendly party bus and visit several Minneapolis taprooms! Tickets are $30 per person (plus $3 cc fee) and includes transportation between 3 taprooms on a pawty bus! Attendees will also receive swag bags with goodies from participating taprooms and Dogs of MSP. We will meet/park at Able Seedhouse & Brewery where there's a free parking lot. We'll spend the first hour at Able Seedhouse, and then we'll be picked up by our party bus. Join us for a fun-filled afternoon at our January Meet Up! Bring your pup to this free event, where you will enjoy the company of good friends, good conversation, and good pups (and good craft beer, too)! If beer isn't your thing, Lakes & Legends Brewing Company offers kombucha, ginger ale and Spruce Soda Co.
From pop sockets to matching human and dog apparel, swing by and check out our latest merch (we are always adding to our collection)! We will be releasing a brand *NEW* buffalo plaid dog hoodie! We also will be selling Finley’s dog treats - they are a locally-owned company started by two school teachers and 50% of proceeds help people with disabilities. Egg rolls, dumplings, and wontons, oh my! KCM Egg Rolls will be the food truck. We'll be one of over 60 vendors at this dog-friendly and free to attend market at Sunnyside Gardens. Guests will be able to shop the very best craftspeople, artisan food producers, and ready-to-eat food makers the North has to offer. The event will take place 9 AM - 2 PM in the greenhouses at Sunnyside Gardens alongside their huge Christmas tree lot, making it the Twin Cities' most charming one-stop shop for unique holiday gifts, decadent gourmet treats, and winter home and garden decor. Holidazzle is dog-friendly everywhere! Bring your pup and visit us in the Holidazzle Shops Tent! This indoor heated tent will be packed full of local artists, so come say hi and shop our collection of human and dog apparel (printed and designed in Minnesota). There will also be local beer and coffee vendors in the tent, so it's the perfect place to warm up with a drink while you do some holiday shopping. Holidazzle is a festive outdoor celebration taking place annually in Loring Park in downtown Minneapolis. The family-friendly and dog-friendly event features an ice-skating rink, visits from Santa, outdoor movies, fireworks, food and drink vendors, artists, and more. Here’s where you will find us! Holidazzle is dog-friendly everywhere! Bring your pup and visit us in the Holidazzle Shops Tent (we'll be there 12/15 too)! This indoor heated tent will be packed full of local artists, so come say hi and shop our collection of human and dog apparel (printed and designed in Minnesota). There will also be local beer and coffee vendors in the tent, so it's the perfect place to warm up with a drink while you do some holiday shopping. Here’s where you can find us! Come out to Maplewood Mall for photos with Santa! Photo packages will be available to purchase. More details about the event can be found here. Dogs of MSP will be there for a pop-up and we’ll be selling our merchandise and hanging with our friends! Come shop our holiday pop up at Hewing Hotel, and check out their beautiful holiday decor! Has your dog been NAUGHTY or NICE this year?! Bring your pup by Lakes & Legends Brewing on Sunday, December 2nd for our December Meet Up! Mr. & Mrs. Claus will be parking their sleigh at the closest meter, so grab your matching ugly Christmas sweaters (or matching Dogs of MSP hoodies) and come see us! Please bring $5 cash for this unique opportunity to get a photo with Mr. & Mrs. Claus. The talented Jenna Dailey will be capturing photos, so these portraits are guaranteed to be Christmas card worthy! Come relax with us and enjoy a beer or non-alcoholic beverage from Lakes & Legends in a festive, cabin-like setting in their spacious dog-friendly taproom. Our monthly meet ups are FREE, and they are a great way to meet other dog owners and connect with your community. Need the perfect gift? We will have our pup-ular human and dog swag for sale, and we'll be rolling out a few brand new items, so stay tuned for sneak peeks on our social media. Support local this holiday season. Dogs are welcome inside the taproom but must remain on a 6ft or shorter leash. Please only bring well-behaved, non-reactive and non-aggressive dogs to the event. 1.) Metered street parking available in the Loring Park neighborhood. Most meters run until 6pm. 2.) 90 minutes of FREE parking is available in the LPM parking ramp located above the Lakes & Legends taproom. The entrance to the ramp is located on 14th St between LaSalle and Spruce. (Note: You have to enter/exit the ramp through LPM Apartments). Must have validation coupon (ask any taproom staff member). 3.) $3 for 3 hours of parking is available in the Hyatt Regency parking ramp located at the intersection of Nicollet & Grant (across from Ichiban's). Must have validation coupon (ask any taproom staff member). Come out to West Elm and use their store as your holiday card backdrop! Come get your family photo snapped by a pro for a picture-perfect card. There will be a photographer taking holiday photos and West Elm will donate $1 for every photo posted on social media on November 29th and tagged with #westelmxaspca. Plus, Dogs of MSP will be there, so come shop our swag! RSVP: Include your RSVP link (www.westelmxaspca.splashthat.com) in your profile and encourage customers to RSVP via link in profile. The MN Christmas Market is an annual pop-up holiday shopping event that showcases homegrown brands and makers, with a charitable twist. All vendors will donate a portion of sales from the event to three local charities that help kids in the Twin Cities. Dogs of MSP will have a booth set up on the patio, so be sure to stop by and say hello to us! We will be donating a portion of proceeds to The Reel Hope Project which helps kids in foster care get adopted. We'll have our sought-after merchandise for sale (including several brand NEW human apparel items and doggie bandana prints). The holidays will be around the corner before we know it, so now is a good time to get some early holiday shopping crossed off your list! Love Your Melon Limited Release Party! Dogs of MSP and Love Your Melon have collaborated to create a limited edition hat! To celebrate, we will be throwing a release party at HeadFlyer Brewing! We will just have the beanies at the event (not our usual merch), but we'd love for you to come hang out with your pup - taproom is dog-friendly inside! The event is free to attend and open to anyone, but if you want a hat, we highly recommend purchasing the VIP ticket prior to the event, and picking up your hat once you arrive. We have a very limited number of hats, and we expect to sell out quickly! If we do have any remaining hats, they will be available to purchase at the event. Tickets will be available soon, but those on our email list will be the first to know --> https://bit.ly/2P4ysYO. The black speckled gold beanie features a black leather patch with gold foil writing. The hat is made of 100% cotton, thick-knit yarn and sewn locally, in St. Paul, Minnesota. Slouched beanie, no cuff and no pom. This is the only hat option available. Mark your calendars and get ready for fun at the annual Underdog Rescue fundraiser! It will be time to celebrate all of the adopted dogs and support dogs still in foster care, as well as future rescues. The holidays will be right around the corner and with local area vendors, artisans and silent auction items, you can do your holiday shopping while helping to save lives. This event is free and open to the entire family, even the friendly outgoing furry four-legged members. There is something for everyone and will also include tasty food, thirst-quenching beverages and of course the stars of the event – many adoptable dogs will be available to meet and fall in love with! The dynamic duo is back for a threefold event: Inbound BrewCo's annual Barktoberfest celebration, our October Meetup, *AND* the two year anniversary of Dogs of MSP. It's the dog event of the season, bringing together your favorite dog-friendly establishment and your favorite dog-loving group of humans. Your pup is welcome in the Inbound taproom every day of the year, but today is something special. We're closing down the road to create plenty of space for your dog to roam, play, and make new friends. It’s not always easy being a newcomer in the the MSP region. Many Minnesotans have roots that reach beyond even kindergarten. So where do you find your people? Join MSP HELLO and Dogs of MSP for an afternoon of tail wags, connection, and community. First round of drinks is complimentary, and Dogs of MSP will be selling their merchandise. 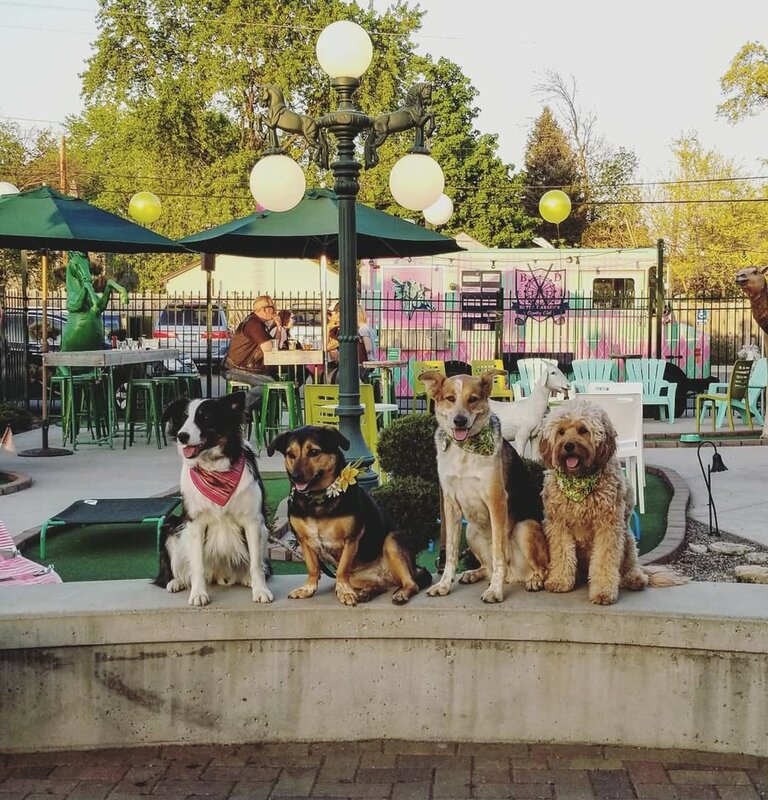 Enjoy one of the last days of patio weather at Venn Brewing Company for the Dogs of MSP September Meet Up! The event is FREE to attend, and if you are a lover of dogs, this is the place to be! Grab a beer with friends, splurge on good eats from the food truck (Sandy's Grill), and mingle with new pals and local insta-famous pups. We'll have our pup-ular Dogs of MSP swag for sale (doggie bandanas, doggie apparel, and cool gear for the humans too). The event is all ages, so invite your friends, family, and most importantly, your pups! All dogs are welcome both inside and outside the taproom as long as they are leashed and well-behaved (sorry, no retractable leashes or leashes over 6 feet). Raise the Woof, It's Woofstock! Once a year the village of Linden Hills rolls out a red carpet, walks its haute dogs and the pup-arazzi follow! Woofstock is a party for pups and their peoples to come together to celebrate their love of all things dog. That means live entertainment with The Linden Hills and Lake Harriet House of Music, our 11th Annual Average Dog Trick Contest and fido fashion show, gifts and goods made by dog lovers for dog lovers, puppy pats for rescue dogs, kids crafting with Heartfelt, a chill Pooch Patio and fantastic food truck eats! Finnegan's will have a bar set up outside on their spacious dog-friendly patio (note that dogs will need to stay outside). There also will be a server going in and out & taking drink orders. Please only bring well-behaved, leashed dogs who are up to date on shots (we recommend no retractable leashes or leashes over 6 feet). Dogs of MSP will have a booth at the St. Paul Food Truck Festival! We will have our merch for sale (apparel, dog apparel + glassware), and our adorable dog bandanas which are sold exclusively at events. We'd love for you to come visit us! Food. Beer. Live Music. Dog Friendly. The third annual Food Truck Festival in Lowertown St. Paul will feature 40-plus food trucks, games, fashion trucks, and live music all day. Back by popular demand, the headlining artist will be Alex Rossi Music. More than 40 food trucks will surround Mears Park selling their special concoctions with global cuisines ranging from Indian to British to Japanese to locally grown pork. We have teamed up with KME Photography to offer a discounted deal on pet portrait/family mini sessions! As a friend of Dogs of MSP, sessions are discounted, and $50 from your session will be donated to the rescue/shelter of your choice! For more details, click here. To register for a session, email kmephoto@gmail.com. During this event, $1 of every Great Wit North, Marigold, and Barncat IPA sold will go to P4P and the animals they work with. Also, Dogs of MSP will be on site selling some awesome merchandise and will donate 10% of their proceeds from the day to P4P. Lastly, for a $5 donation to P4P, guests and their dogs will have an opportunity to have a professional photo taken by KME Photography with KDWB's Falen KDWB from 6-7 pm. One of the Twin Cities most popular & delicious free events – The Food Truck Festival– will invade Downtown Anoka on Saturday, July 21st. Food. Beer. Live Music. Join Dogs of MSP and Lakes & Legends as we close down 14th street for Dog Days of Summer Street Festival. This event is all ages, so invite your friends, family, and most importantly, your pups! We'll have food and music, dog friendly vendors, and of course, Lakes & Legends craft beer. We'll also be raffling off two Taylor Swift tickets and some fun items for your doggos, with all the proceeds going to our friends at Pause 4 Paws. Prepare yourself for a pupperific event! One of the Twin Cities most popular & delicious free events – The Uptown Food Truck Festival– invades Lake & Hennepin on Sunday, June 24th. Food. Beer. Live Music. Dogs of MSP will have a booth at the event, so swing by and say hello and stock up on our latest merch! Open Streets is a free event bringing together community groups and local businesses to temporarily close Lyndale Ave S to car traffic, opening it up for people walking, biking, rolling, and playing. Our June Meet Up will be at Omni Brewing, and we are partnering with Save-A-Bull. We will be donating 10% of our merch proceeds that day to Save-A-Bull and Omni will be donating $1 from every pint to help pitties in need! Expect lots of extra excitement, prizes (there will be a raffle) and DOGS at this event as we all support rescue together.